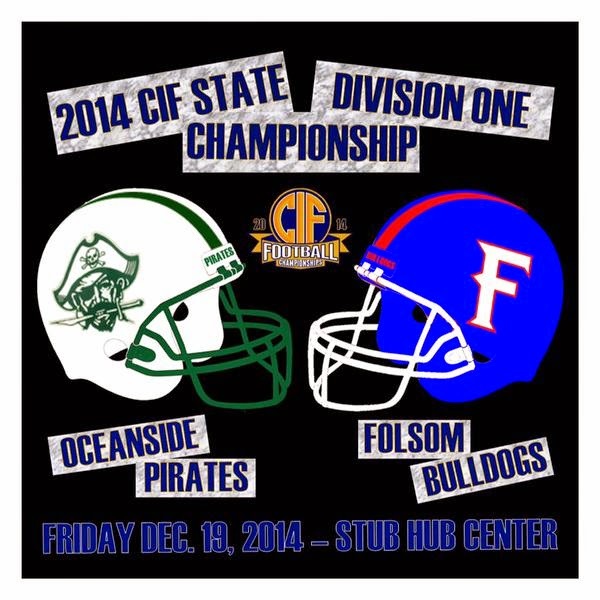 CARSON (12/19/2014) Folsom quarterback Jake Browning threw for 445 yards and six touchdowns as he led his Bulldogs (16-0) to a 68-7 rout over the Oceanside Pirates (14-1) in the CIF Division I State Championship at the StubHub Center Friday night. Browning finished the season with 91 passing touchdowns to tie the national single-season record. He also broke the career record with 229 touchdown passes, while Folsom as a team set a new national record for most points in a season with 915. An eight-yard quarterback keeper by Matt Romero gave the Pirates a 7-0 lead, making them the first team to hold a lead over the Bulldogs this season. After a 7-7 tie to end the first quarter, Folsom put up five touchdowns in the second quarter to give them a 41-7 lead at the half. The Bulldogs continued to pile on in the second half with 27 more points, including an interception returned for a touchdown during the final play of the game. The San Diego Section's last hope for a state champion will take place Saturday at noon when the El Capitan Vaqueros (14-0) square off against the Campolindo Cougars (15-0) for the Division III title. The game can be seen online at twccommunity.com. The Vaqueros are coming off a 41-0 win over Paso Robles in last week's Southern California Regional Championship.